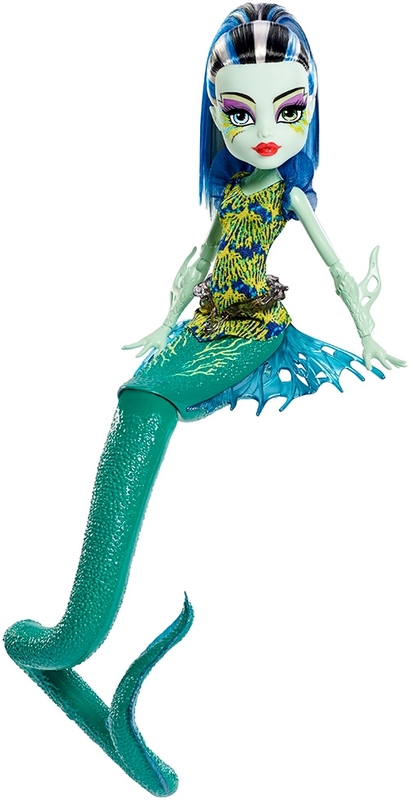 When the Monster High™ ghouls get pulled down under to the homeland of Lagoona Blue™ in the Monster High™ Great Scarrier Reef movie -- they find themselves underwater where they become fish-i-fied for a sea-faring adventure. Inspired by an ocean creature that fits her character, Frankie Stein™, daughter of Frankenstein, stuns as an electric eel. Her unique sea-colored tail allows the doll to stand on her own! A print top matches the spark markings on her tail, and accessories -- like a gore-geous belt -- highlight her fabulously freaky fishiness. 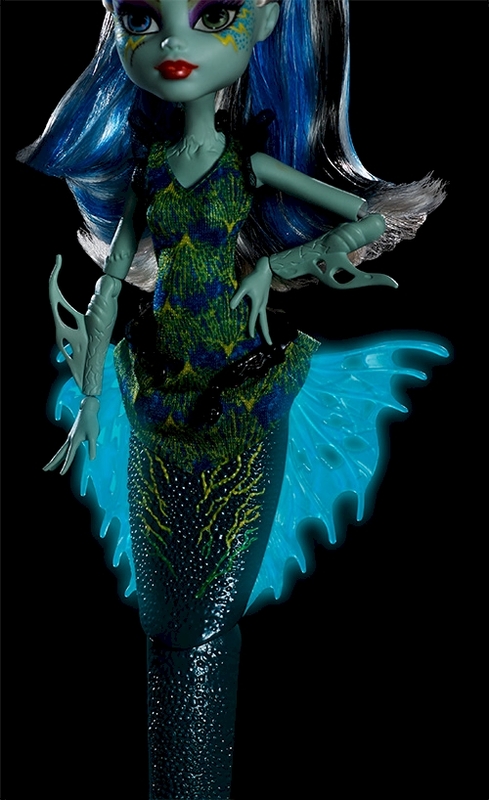 To really make a splash, glow-in-the-dark accents on her fins and face add cool, bioluminescent effects. Use the articulation in her tail to create water-inspired poses. Fans of the movie will love recreating scenes or playing out new adventures. Collect all of the Monster High™ fish-i-fied dolls for an ocean full of Monster High™ ghoulfish (each sold separately, subject to availability)! Includes Frankie Stein™ doll wearing fashion and accessories. Colors and decorations may vary. Features: When the Monster High™ ghouls get pulled down under to the homeland of Lagoona Blue™ in the Monster High™ Great Scarrier Reef movie -- they find themselves underwater where they become fish-i-fied! 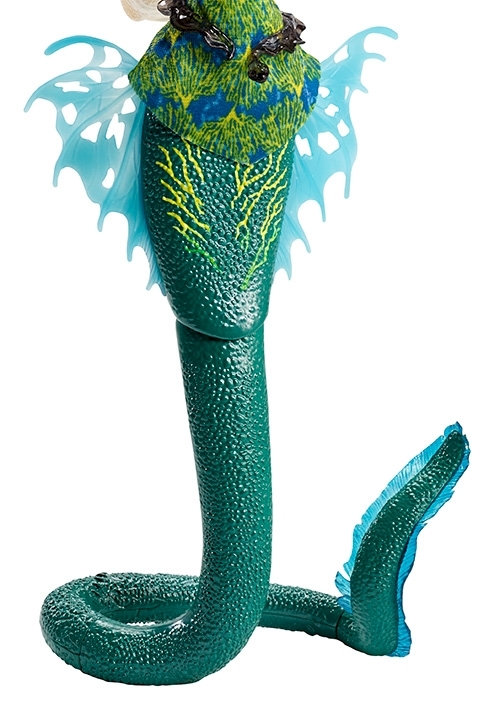 Inspired by an ocean creature that fits her character, the Frankie Stein™ doll stuns as an electric eel. She has a unique tail that curls to allow the doll to stand on her own! Glow-in-the-dark accents on her fins and face add cool bioluminescent effects. Accessories -- like a gore-geous belt -- highlight her fabulously freaky fishiness. A print top matches the electric spark markings on her tail. Use the articulation in the tail to create water-inspired poses. Collect all of the Monster High™ Great Scarrier Reef dolls for an ocean full of Monster High™ ghoulfish (each sold separately, subject to availability; colors and decorations may vary). MONSTER HIGH and all associated trademarks and trade dress are owned by Mattel. ©2015 Mattel. All Rights Reserved.